The top of the blade when the knife is viewed properly, point to the left, handle to the right. A shoulder belt or sling for carrying a sword. A heavy nylon type material used for gun cases and knife pouches. A design that is not less than 150 years old. This was an inexpensive knife usually made with iron bolster and liners, always a one or two blade jack knife with longer than normal bolsters(2 1/2 times that of a simple jack); today barlow knives are usually made in keeping with each firms standard quality and are much sought after by collectors. The combined tool and weapon of the Moros of the southern Philippines. The Barong has a leaf shaped blade of about 15 inches by three inches wide that curves to the point and to the handle on both the edge and the back. A knife with a Cap Lifter and a Corkscrew. A sword hilt that entirely covers the hand with connecting bars from guard to pommel, best known of these is the Scot's Broadsword, less well known is the Venetian Schiavonia. 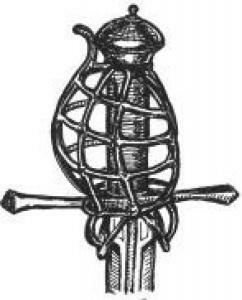 A knife, sword or spike intended to be fastened to the end of the barrel of a rifle or musket. The first bayonets were called plug bayonets because the handle was plugged into the barrel. Bayonets were very important when the firearm was single shot, much less important with fully automatic weapons. The earliest bayonet was the so-called Plug Bayonette which was a large dagger with a small pommel that "Plugged into the barrel of the musket changing it into a pike. 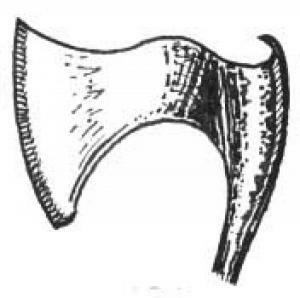 An axe with the lower part of the edge hanging below the principle part of the head as does a goose wing ax. Many of the northern Germanic peoples used axes of this type both for felling trees and for fighting. The Belly of a knife blade is the part of the edge that transitions from a straight line up into the point. It is the curve along the blade. Formed in 1976 to produce knives designed by Blackie Collins who died in 2011. 5 blades in a Peanut style configuration. Bob Loveless and I tried this steel in the 1970s and found that it was a very superior knife steel but that it was really more trouble than it was wosrth. Bob continued to use it from time to time, I never used it again. 1.15 Carbon, 0.50 Manganese, 14.5 Chromium, 1.20 Vanadium, 4.0 Molybedenum. A coating put on military knife blades to kill all reflection. The correct term is "Black Lip Mother of Pearl". This is very rare and probably the most expensive of all mother of pearls. One who forges a blade to shape. I hate to tell you this, because this term really sells knives, there is no such thing as a blood groove and there is no sucking action that will hang up a knife in a victims body. The term is "Fuller"; this is a groove that lightens and stiffens the blade. 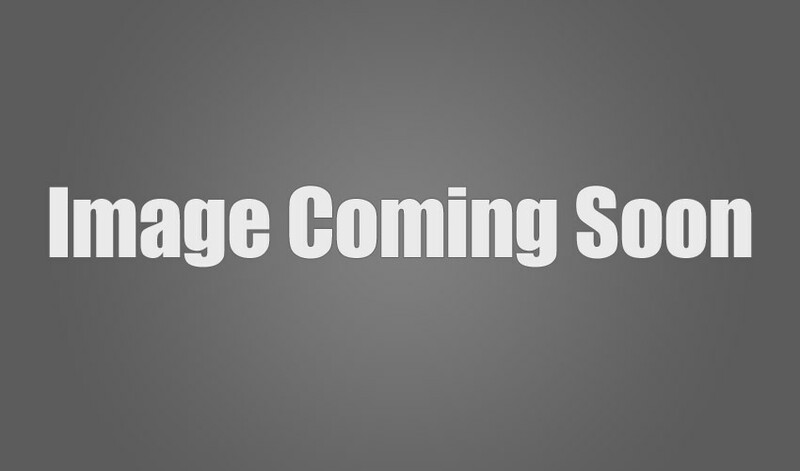 The word is Spanish but has come to mean a large jungle knife used in the Philippines. The metal material at the blade end of knife handle; today these are usually of nickel silver or a mild stainless steel. In older less expensive knives they were often made of iron or mild steel. There is no single historical shape, but today it is thought to be a blade shaped very much like the Buck 120 blade. A large knife with a blade that might range from 6 to 14 inches; the original had a blade that was probably 9 inches long with a sturdy guard projecting from both the top and bottom of the knife between blade and handle. Invented by Rezin Bowie and made famous by his brother James, who died at the Alamo. The man who made the Bowie knife famous, The knife was actually designed by his brother Rezin. Has a fixed guard top and bottom as part of the bolster. A low cost, simple, one blade slip joint knife. A company started by Al Buck whose father had taught him to make knives. Al started in his garage and in the 1960s incorporated and began to make production knives. These are really nice people who make good quality knives. The knives of a special 420HC and better stainless have developed a reputation for being difficult to sharpen, if you sharpen them on ceramic or diamonds you will never have any problem. A metal, stag or plastic fixture at the pommel (the end away from the blade) end of a knife handle. A small version of a canoe.